Q1. Where did you get your chickens? A1. We have 7 chickens right now. We bought the first 3 as chicks about 15 months ago at a local feed store. We ordered 4 more at the end of October from Ideal Hatchery because we wanted specific breeds that we couldn't find locally. Q2. What do you do with them in severe weather conditions? A2. Our severe weather is heat. We have misters that we run in the summer for them, and we put jugs of ice in the coop. We did lose a chicken last year before we figured out the mister thing - we moved the water supply and she was too dumb to figure out where it went. I think you're in San Diego, so that would be your main concern too. We have friends who have tons of snow, and they have a heater for their waterer and an insulated coop, but the chickens are generally fine in the cold. Q3. How much maintenance is involved? A3. They're pretty low maintenance. If you buy a large feeder and large waterer then you can go for a few days between feedings. We tend to feed and water each morning and evening because it's the kids' responsibility to care for them. They clean out the coop once every two weeks and we compost the pine shavings/chicken poop. That's really it. They're our lowest maintenance pets. A4. Not at all. Each chick is $2-4 and we spent less than $100 building the coop with mostly found materials. The feed is about $18 per 50 lb. bag of natural/organic feed. That lasts us for a month for all 7 chickens. We also feed them all of our veggie scraps and some fruit as treats. They're particularly fond of carrot greens and apples. Q5. What do your chickens live in? You can definitely spend a lot of money on a coop, but you don't have to. Here's what mine looks like: http://www.flickr.com/photos/spjacksonphoto/3438675060/. 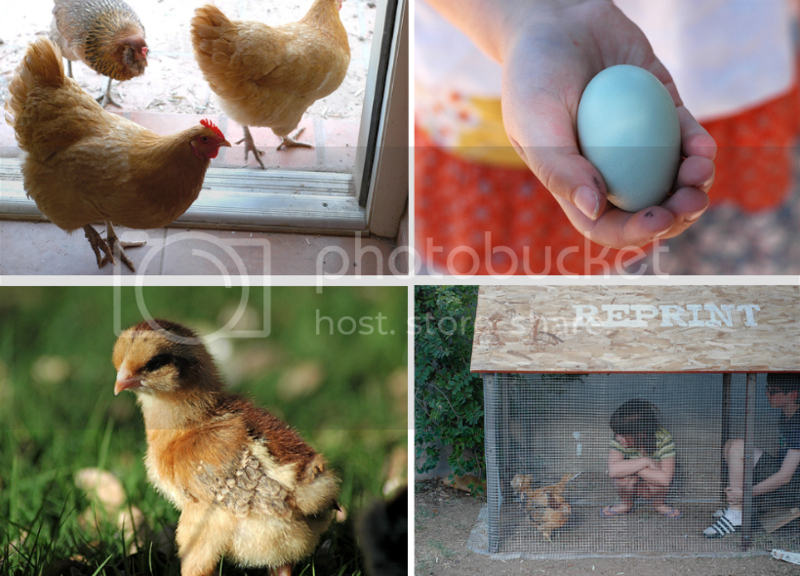 There are a ton of ideas at Backyard Chickens. Q6. How old were your chickens when you got them? Did it take a while before they started laying eggs? A6. We got all of our chickens as chicks. We wanted them to imprint on us, so we bought babies and raised them by hand. The kids can still pick them up and carry them around. It takes anywhere from 16-24 weeks for them to start laying. Our first ones laid at about 18 weeks and the newer ones are 24 weeks now and need to get on the stick. They're heritage breeds, so they take longer. Q7. What kind of chickens do you have? A7. We have 1 Ameraucana/Easter Egger that lays turquoise eggs, 2 Buff Orpingtons who lay big light brown eggs, 3 Welsummers who will lay dark brown speckled eggs, and 1 Barnevelder who will lay very dark brown eggs. They're all more docile breeds who are friendly and typically good with kids. Q8. Are there ones that are better with children than others? A8. Most chickens will be good with kids if they're raised by hand from chickhood. However, I'd stay away from New Hampshire Reds and Rhode Island Reds because they're a bit more aggressive. We picked the breeds we have for personality as well as egg color. We adore our chickens - they're funny and easy to have and we get glorious eggs. I also advise haunting the forums on www.backyardchickens.com for TONS of information. Hope that helps! What? My Rhode Island is the sweetest out of all of my girls! Hand raising them definitely makes a difference. The few that we rescued are still super shy. Ok, I just found your site via http://RikshawDesigns.blogspot.com, the week of guests... I'm adding you to my sidebar! Your blog feels so wonderful. I've only gotten this far and already I wish you lived next door. Hi, I'm Champagne Maker (dumb name, I know, all acquired, not given, and I'm not a stripper...well, sometimes furniture, but no pole) I just wanted to say hi and introduce myself cuz I'm gonna be here every day. I mostly knit (StitchPoet.blogspot), but I make a bunch of stuff (ChampagneMaker.blogspot), I push antiques around at Rooney Robison Antiques (.blogspot) and I compile way more inspiration than I can use on CrushParty (.blogspot) and spend way too much time on the internet, haha but that's not my fault. It's folks like you that make me do it. I'm going to reblog this collage on CrushParty, but you holler at me if you want me to take it down, but I'll link back. Let me know if you hate it when people do that. See you tomorrow! Bye!